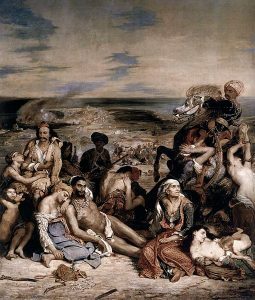 The events on Chios provoked (not least thanks to Delacroix’ painting) a sense of outrage throughout Europe and a feeling of solidarity with the Greek striving for freedom virtually throughout the entire continent. The Philhellenism, which originated in the late 18th century from a cultural enthusiasm for ancient Greece, now took on tremendous political relevance in the wake of the reporting on the massacre. Philhellenic committees – initially in German speaking countries, then in France and Great Britain as well as other European countries – began to form to recruit volunteers to fight in Greece, to collect funds for the insurgents, and, in general, to mobilize public Support. In their campaigns, the European Philhellenes deliberately emphasized massacres like the one on Chios and the enslavement of Christians by Muslims. They thus portrayed the Greek struggle for independence as a fundamental conflict between “occidental Christian civilization,” on one side, and Islamic “Oriental barbarism,” on the other. The aim here was to legitimate in the strongest possible terms the active intervention of the major powers of Europe. The events on the eastern Aegean island, which lay at the geographical crossroads between Europe and Asia, accordingly became a powerful symbol in the public perception of the “Turkish atrocities.” In this way, a stigma of the Ottoman Empire as an uncivilized, despotic state in the East was encouraged. This ultimately manifested in its disadvantaged and subordinate status in international law to the European countries in the 19th century. By no means did the massacre of 1822 prompt an immediate reaction from the major European powers. Leading powers like France and Great Britain initially rejected the idea of military intervention. They feared any unintended consequences it might have on the peace order that had just been established following the defeat of Napoleon. In the medium term, the massacre of Chios nonetheless proved to be an important catalyst for policy change. With their propaganda campaign, the Philhellenes not only succeeded in embedding the Greek struggle for freedom in the public consciousness, but also in the highest government circles. Finally, after rumours circulated in 1825 about a so-called “barbarization project”, according to which the entire Christian population of Greece had been enslaved and sent to Egypt, the time had come to act. Britain had declared the fight against the slave trade to be a foreign policy paradigm, which it had already implemented militarily in West Africa – a form of the first humanitarian intervention in history. For the British, a rerun of the scenario on Chios was unthinkable. On July 6th, 1827, Great Britain, Russia, and France agreed in the Treaty of London on a joint enforcement action to pacify Greece, which they justified with “sentiments of humanity”. These coercive measures escalated on October 20th, 1827, when the Allied naval force destroyed the Ottoman fleet in the harbour of the Greek city Navarino to prevent the Ottoman forces from continuing their “brutal war of extermination”. Ultimately, the result of this intervention was the independence of Greece from Ottoman rule in 1830. The Massacre of Chios, however, was not only a landmark episode in the Greek War of Independence and in European intervention policy for the protection of Christian minorities in the context of the “Eastern Question” in the 19th century. It also signifies a constellation of infringements on humanitarian norms, along with the related civic mobilization of the public and international intervention policy under the banner of “humanity” – a constellation that appears to be more relevant today than ever. David Brewer, The Flame of Freedom. The Greek War of Independence 1821–1833, London 2001. Alfred Czech, Eugène Delacroix: Das Massaker von Chios 1822, in: Michael Wobring / Susanne Popp (eds. ), Der europäische Bildersaal. Europa und seine Bilder, Bonn 2015, pp. 62–73. Helen Long, Greek Fire. The Massacres of Chios, Bristol 1992. Davide Rodogno, Against Massacre. Humanitarian Interventions in the Ottoman Empire 1815–1914, Princeton/Oxford 2012. ↑Original title: “Scènes des massacres de Scio; familles grecques attendent la mort ou l’esclavage”. ↑Treaty between Great Britain, France, and Russia, for the Pacification of Greece, July 6th, 1827, in: British and Foreign State Papers, Vol. 14, 1826¬–1827, London 1828, p. 633. URL: http://hdl.handle.net/2027/mdp.39015035798480 (08.16.2016). ↑Letter from British commander Edward Codrington to Prime Minister George Canning, October 20th, 1827 in: The National Archives, Kew, U.K., FO 881/6A. Fabian Klose, Chios / Χίος, in: On site, in time. Negotiating differences in Europe, ed. for the Leibniz Institute of European History (IEG) by Joachim Berger, Irene Dingel and Johannes Paulmann, Mainz 2016. URL: http://en.ieg-differences.eu/on-site-in-time/fabian-klose-chios, URN: urn:nbn:de:0159-2016110386. This entry was posted in Actualités / News, Articles and tagged Humanitarian Intervention, Humanitarianism, Massacre of Chios by Fabian Klose. Bookmark the permalink.